Studies have shown NLRP6 lessens symptoms in colitis. So when researchers looked at NLRP6's impact on graft-vs.-host disease, they assumed it would also be protective. "There are a lot of reasons NLRP6 seemed to work well in those other diseases, but in the case of GVHD, it seemed to do the opposite. In mice where we knocked out NLRP6, instead of doing worse, they did better. That was a big surprise," says co-senior study authors, Pavan Reddy, M.D., deputy director of the Rogel Cancer Center and division chief of hematology/oncology at Michigan Medicine. The second surprise was that NLRP6 played a role that was not dependent on microbiome composition. Previous data had suggested NLRP6's protective role is directly related to the microbes within the intestinal tract: the more good microbes, the more protective effect. "Even when we did all of those manipulations, the protection was still there in the NLRP6-knockout mice. The composition of the microbiome does not seem to matter, unlike with other disease processes," says study author Hideaki Fujiwara, M.D., Ph.D., a post-doctoral researcher in Reddy's lab. "Just measuring changes in the microbiome is not always sufficient. We have to look at what specifically changes and the consequences of those changes. 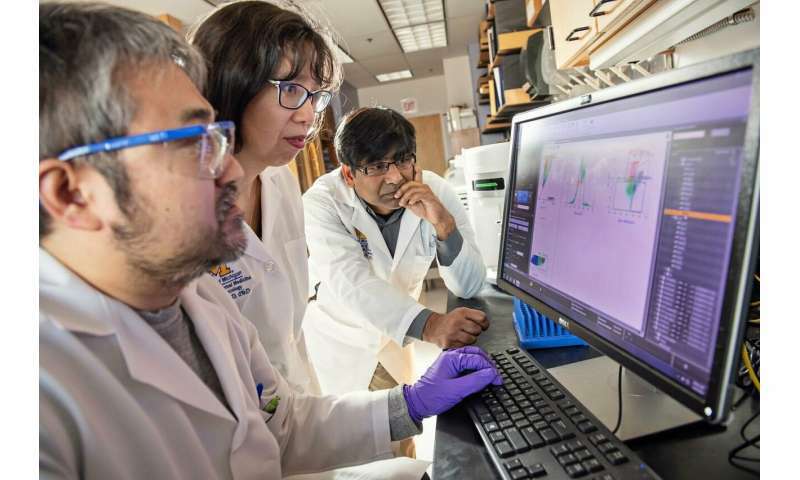 A change that leads to the generation of metabolites like taurine or other proteins or enzymes will need to be understood to comprehend the effects of the microbiome on GVHD," says co-senior author Grace Chen, M.D., Ph.D., associate professor of hematology/oncology at Michigan Medicine. "Conceptually, if we can target this protein and block NLRP6, we can mitigate intestinal GVHD. Or, if you look at it the other way, changing the diet or microbiome to avoid an excessive amount of taurine could be another way to reduce GVHD," Reddy says. NLRP6 is expressed in gut cells but not in the tumor cells the researchers studied. This means the bone marrow transplant could do its job to eliminate the tumor. In principle, blocking NLRP6 could limit GVHD without limiting the transplant's anti-tumor effect.